Facebook vs. LinkedIn advertising: which one is suitable for your business? 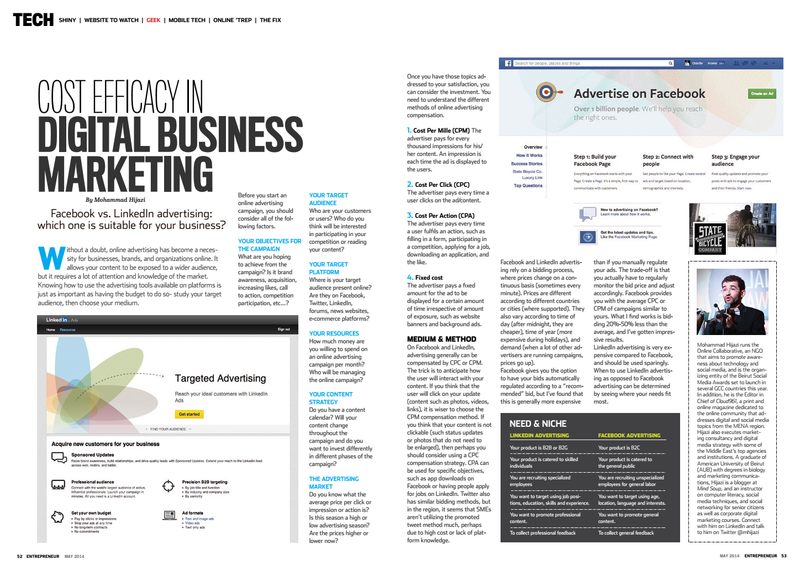 A version of this article was published in Entrepreneur Middle East and Entrepreneur Qatar magazines on pages 52-53. Without a doubt, online advertising has become a necessity for businesses, brands, and organizations online. It allows your content to be exposed to a wider audience, but it requires a lot of attention and knowledge of the market. Knowing how to use the advertising tools available on platforms is just as important as having the budget to do so- study your target audience, then choose your medium. Before you start an online advertising campaign, you should consider all of the following factors. What are you hoping to achieve from the campaign? Is it brand awareness, acquisition, increasing likes, call to action, competition participation, etc…? Who are your customers or users? Who do you think will be interested in participating in your competition or reading your content? Where is your target audience present online? Are they on Facebook, Twitter, LinkedIn, forums, news websites, e-commerce platforms? How much money are you willing to spend on an online advertising campaign per month? Who will be managing the online campaign? Do you have a content calendar? Will your content change throughout the campaign and do you want to invest differently in different phases of the campaign? Do you know what the average price per click or impression or action is? Is this season a high or low advertising season? Are the prices higher or lower now? Once you have those topics addressed to your satisfaction, you can consider the investment. You need to understand the different methods of online advertising compensation. The advertiser pays for every thousand impressions for his/her content. An impression is each time the ad is displayed to the users. The advertiser pays every time a user clicks on the ad/content. The advertiser pays a fixed amount for the ad to be displayed for a certain amount of time irrespective of amount of exposure, such as website banners and background ads. On Facebook and LinkedIn, advertising generally can be compensated by CPC or CPM. The trick is to anticipate how the user will interact with your content. If you think that the user will click on your update (content such as photos, videos, links), it is wiser to choose the CPM compensation method. If you think that your content is not clickable (such status updates or photos that do not need to be enlarged), then perhaps you should consider using a CPC compensation strategy. CPA can be used for specific objectives, such as app downloads on Facebook or having people apply for jobs on LinkedIn. Twitter also has similar bidding methods, but in the region, Twitter advertising is restricted to big brands that can afford to pay at least US$10,000 per month. Facebook and LinkedIn advertising rely on a bidding process, where prices change on a continuous basis (sometimes every minute). Prices are different according to different countries or cities (where supported). They also vary according to time of day (after midnight, they are cheaper), time of year (more expensive during holidays), and demand (when a lot of other advertisers are running campaigns, prices go up). Facebook gives you the option to have your bids automatically regulated according to a “recommended” bid, but I’ve found that this is generally more expensive than if you manually regulate your ads. The trade-off is that you actually have to regularly monitor the bid price and adjust accordingly. Facebook provides you with the average CPC or CPM of campaigns similar to yours. What I find works is bidding 20%-50% less than the average, and I’ve gotten impressive results. LinkedIn advertising is very expensive compared to Facebook, and should be used sparingly. When to use LinkedIn advertising as opposed to Facebook advertising can be determined by seeing where your needs fit most. You want to target using job positions, education, skills and experience. You want to target using age, location, language and interests. You want to promote professional content. You want to promote general content.